Chaminade alumnus, Benjamin Labrot ’94, made a speech early in my sophomore year about his organization, the Floating Doctors and I was hooked. The group takes volunteers approximately 600 miles from Panama City to a region called Bocas del Toro to administer medical treatment. Every weekday they take a small boat with equipment and a couple of volunteers to various smaller islands which do not receive medical attention. As I plan to pursue a career in the medical field, and my mom is a nurse, I felt this would be a great opportunity for us. It ended up being this and more. At first, the idea of going to a third world country did not sound glorious; however, I was excited. Our first day in Panama City did not impress me; it was filled with nonstop traffic, honking, smells of gas, and overpriced taxi drivers. With my weak Spanish, I could not easily communicate with the locals. We slept in a hostel that night, and woke up early the next day to catch another flight into Bocas del Toro. In Bocas del Toro a woman met us and took us to the dorms, which happened to be in front of the airport. This is where we stayed for the next 11 days. The dorm doubles as Floating Doctors headquarters, and was once an airplane hangar. I roomed with all the male med students, and I cannot have asked for three better roommates. 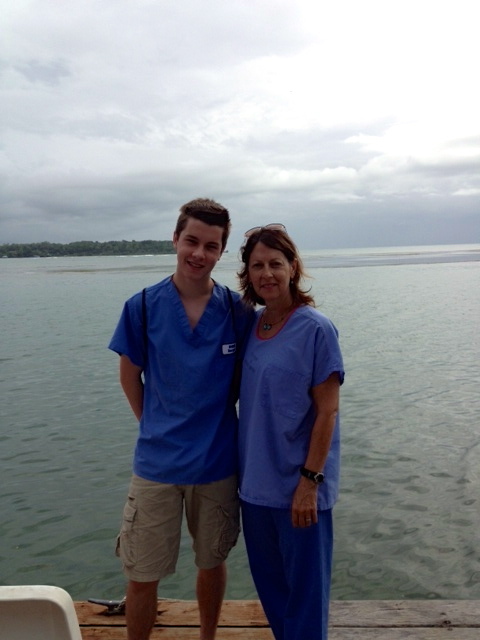 Although we were not able to make the clinic that day, I met an Australian doctor named Tania. She taught me how find respirations, heart rate, and, blood pressure – all of which were useful medical skills to have at clinic. Taking blood pressure took me awhile to perfect, but in about an hour I could do it flawlessly. The next morning I was excited to go on my first clinic; I woke up, ate a simple breakfast, took a freezing shower (there was never hot water), and put on my scrubs. We walked to our meeting place, Rip Tide, a diner on the water with a fabulous vista. It rained for about an hour, and this happened every morning. After and sometimes during the rain, we packed our supplies into two mini boats and drove about 90 minutes to an island and set up clinic. The scenery on the way to every single clinic was beautiful. In every direction we saw mangroves, which are the only plant in the world that grows in salt water, and green mountains rising above everything. At each clinic, about 10 to 12 very excited kids met us and help unload our equipment. I began each clinic helping another volunteer sign in the patients waiting to see a doctor. If there were a lot of people, I practiced taking vitals. 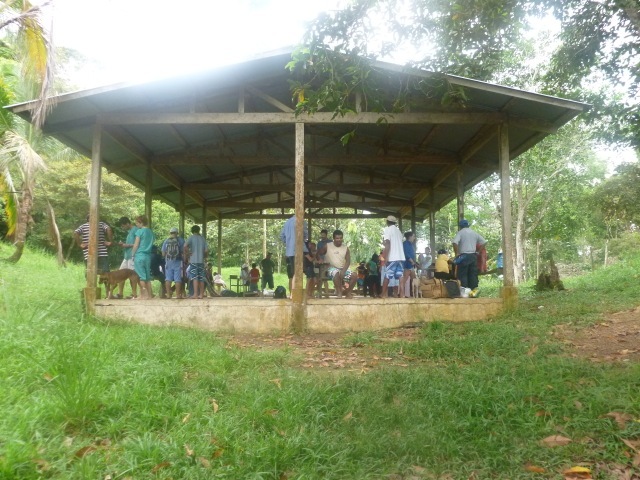 During our third clinic, which was an overnight one, a Floating Doctors veterinarian helped save a woman’s dog. She was so grateful that she invited us to stay in her house for the night on the island of Couchero. We boated five minutes, and were amazed to find her 12- room mansion hiding in the leaves. On normal overnight clinics the Floating Doctors set up sleeping bags, nets, and sleep on the ground. We ate delicious fried rice and eggs for dinner; this was one of the best dinners I had on the trip. We played charades; each chose a room and went to sleep. As it rained one morning before a clinic, and we waited under the roof at Rip Tide when a man in a kayuka (a miniature kayak) boated past us on the ocean. A med student named Shane noticed 10 huge blue crabs in the bottom of the boat and asked how much they cost; the kayuka man said $20. We had crab for dinner back at the warehouse with all the volunteers, med students, and doctors. I learned and saw a lot of things at the clinics just by playing with the kids and occupying them while their parents met with a doctor. Full immersion improved my Spanish, and I learned more about their culture and life challenges. Some houses are just wood planks balancing on four pillars over murky water caused by not having any plumbing. This taught me that I am truly fortunate to have an education, a house on dry land and food every day, and is one of the most important lessons I learned in Panama. After two weeks, which felt like only a couple of days, and it was time to leave. I was sad to go, and this was a unique feeling for me – usually I’m happy to return to the comforts of home. The Floating Doctors community was welcoming, friendly, and fun. The clinics were a whole new world helped me escape from my reliance on technology. In addition to the medical and cultural experience, we spent one last day in Panama City. My first reaction upon arriving there was not pleasant; however, after spending two weeks deep in its culture, touring Old Town and seeing the Panama Canal, I fell in love with this amazing place. Realizing where this industrialized country came from and seeing its main attraction and the background behind the canal, it only made me appreciate it more. Because of this I cannot wait to return over spring break or summer vacation, except this time for even longer. What a wonderful experience at such a young age. I admire you for attempting this…..and more for such a successful venture. Best wishes as you continue on in your life experiences!